Owen Bishop's First Course starts with the basics of electricity and component types, and introduces students to practical work almost straightaway. No prior knowledge of electronics is assumed. The approach is student centred with Self-Test features to check understanding, and numerous Activities suitable for practicals, homework and other assignments. New Multiple Choice Questions are incorporated throughout the text to aid student learning. Key facts, formulae and definitions are highlighted to aid revision, and theory is backed up by numerous examples within the book. Each chapter ends with a set of problems which includes exam-style questions with numerical answers provided. 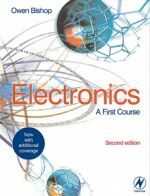 This text is ideal for a wide range of introductory courses in electronics, technology, physics and engineering.